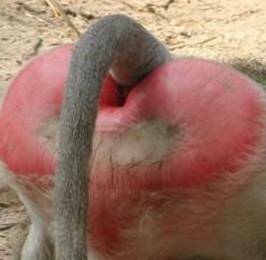 Baboon Syndrome is a systemic contact dermatitis characterized by well-demarcated patches of erythema distributed symmetrically on the buttocks. The cause of the syndrome may be drug-related, sometimes induced by systemic administration of hydroxyzine penicillin, iodinated radio contrast media and others. The typical rash commonly appears on buttocks. This then resembles the colour of a baboon’s buttocks. Other areas, like upper inner thigh and armpits, may be affected by the rash. The rashes are red and well-defined. The presentation is typically symmetrical and not associated with systemic symptoms. Baboon syndrome affects both sexes equally, and can occur at any age, but seems to be more common in childhood than in adulthood.